Building on their generosity to U of T Engineering, Kathleen and William Troost made an additional gift to support engineering leadership education. In their honour, we are the Troost Institute for Leadership Education in Engineering (Troost ILead). To underscore his commitment to ILead, Troost and his wife Kathleen made a $3-million gift to accelerate the Institute’s ability to offer innovative programming that inspires engineering students to develop a foundation of self-awareness, integrity and empathy — all of which are critical to exceptional leadership. The Institute is named,Troost ILead, in their honour. 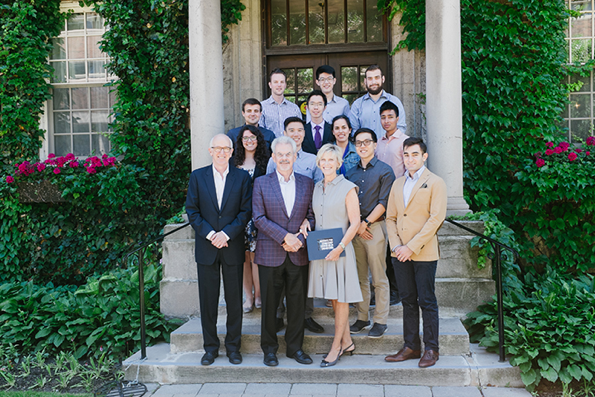 The Troosts have made previous gifts to the Institute, and have contributed to numerous undergraduate needs-based scholarships at U of T Engineering. Their ongoing support signifies the critical and lasting role leadership education plays in preparing engineering students to become resilient changemakers. There’s no better home for Troost ILead than in the Myhal Centre for Engineering Innovation & Entrepreneurship — a dynamic new building dedicated to experiential education and multidisciplinary collaborative research. Troost ILead shares Level 7 of the Myhal Centre with the Centre for Global Engineering.